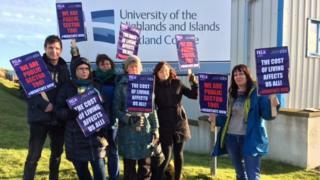 College lecturers in Scotland are to escalate their industrial action over pay. Members of the EIS Further Education Lecturers' Association (FELA) voted to intensify their action which could include boycotting the input of assessment results. They have already staged four one-day strikes. The FELA says members have been offered a 2% consolidated pay rise covering a three year period. However, the association is demanding a larger "fair cost of living" rise. The employers' association, Colleges Scotland, has said most lecturers have received large rises in recent years because of an agreement to equalise pay across the country. It added that there would be one-off payments for lecturers who had not seen large salary rises through this scheme. The FELA said 55% of its members took part in the latest ballot with 90% backing the plan. EIS general secretary, Larry Flanagan, said union officials had "attempted to negotiate in good faith throughout this process, and continue to ask only for a fair pay settlement in line with public sector pay policy". Mr Flanagan questioned whether Colleges Scotland "genuinely" wanted to resolve this dispute. John Gribben, from Colleges Scotland Employers' Association, spoke of his extreme disappointment about the outcome of the ballot backing escalation of the dispute. He went on to say that the move was an "attack on students" and was "recklessly gambling with the futures of college students". Mr Gribben added: "It is not the behaviour anyone would expect from a professional body." Colleges Scotland said it would continue to meet with the FELA to try to resolve the dispute.